I have set up a new Who’s Who page for 1916, showing recurring characters with the roles they have when they first here. Germany’s Zeppelin airships have mainly been conducting bombing raids on Britain. The attacks were meant to so devastate the country that the British would be obliged to sue for peace. Results have however been disappointing, though they have greatly upset the British public. Tonight the Germans send a Zeppelin to attack Paris. 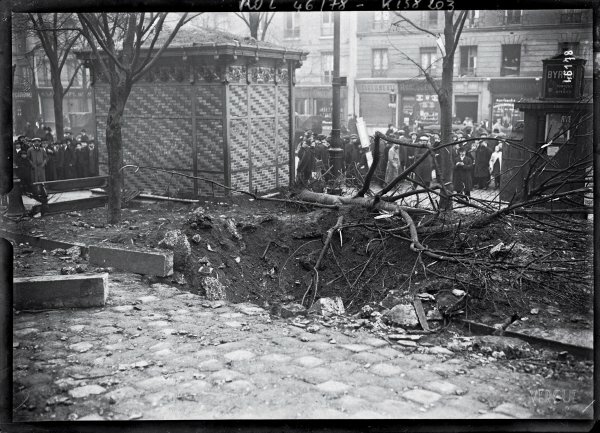 As with attacks on British targets, the bombing causes relatively little damage but a great deal of consternation among the Parisian public. The political and military authorities are subjected to a wave of outrage for allowing the attack to take place. Although the actual damage inflicted by the Zeppelin is minimal, it may have achieved the purposes it was sent for. With the French elite now preoccupied with the capital’s air defence, their attention turns away from indications that the Germans are planning an attack on Verdun. It is the birthday of the Kaiser Wilhelm II of Germany. Perhaps it is not just coincidence that German chief of staff Erich von Falkenhayn today issues the formal orders for the great offensive against Verdun he is planning. The attack will begin in just over two weeks time, on the 12th of February. Nine divisions will attack towards Verdun on the eastern bank of the Meuse river, supported by a vast weight of artillery. The local commander of the offensive is Crown Prince Wilhelm of Prussia, the Kaiser’s son and heir, ably assisted by career army officer General Schmidt von Knobelsdorf. In the planning stages of the offensive they have clashed with Falkenhayn, because they think the attack should proceed on both banks of the Meuse. But Falkenhayn insists that he does not have enough troops available for so broad an offensive. He must keep men back to cover the counter-attacks elsewhere on the line that he is sure will follow once the attack on Verdun begins. Preparations for the offensive continue in the utmost secrecy. To avoid Allied reconnaissance aircraft spotting anything unusual the Germans have concentrated their fighter planes in the Verdun sector. Their artillery pieces are camouflaged to hide them from prying eyes. Underground shelters close to the front are being dug for the German troops; these stollen will be used to conceal and shelter troops who might otherwise be noticed waiting for the attack in forward trenches. The secrecy cannot be total. The Allies are beginning to suspect that something might be up, but the Germans are cleverly engaging in diversionary activities along the line to keep the British and French off balance. Haig and Joffre increasingly realise that the Germans are planning to attack somewhere, but they are still not certain that Verdun is the target. Britain entered this war with an all-volunteer army, making her unique among the major combatants of Europe. The British army was small at the war’s start and suffered horrendous casualties during fighting in late 1914 that more or less wiped out the pre-war cohort of troops. Since then large numbers of volunteers have swelled the ranks but now recruitment has slowed. Voluntary enlistment will not maintain the British army at the level needed to fight the war. The solution for this problem is conscription. Today the Military Services Act becomes law, allowing the authorities to forcibly recruit unmarried men into the army. The measure is controversial, with trade unionists particularly opposed. Exemptions are put in place for men working in a variety of key professions or where their recruitment would lead to extreme hardship for their families. The Act only applies to England, Scotland and Wales. Irish nationalist politicians had strongly objected to conscription (while maintaining support for the war itself). The British government decides that it would be best not to provoke unrest in Ireland by forcing people there into the army. Montenegro has been invaded by Austria-Hungary and Germany. Most of the country has been overrun. King Nikola has fled together with most of his government. The army has been disbanded but now the Austro-Hungarians insist on a formal surrender by what is left of the country’s government. Already mostly overrun by Austria-Hungary, Montenegro is now placed under formal military rule by its occupiers. 24/1/1916 Afghanistan allies with Germany. Or does it? Germany has sent a diplomatic mission to Afghanistan, hoping to persuade the country’s king to launch an invasion of British India. The mission is led by Oskar von Niedermayer, an orientalist adventurer, and Werner von Hentig, a career diplomat. They have been received cordially by the Afghans but King Habibullah has been non-committal in his responses to their entreaties. But now at last Habibullah signs an agreement with his German guests. The agreement appears to commit the Muslim king to launch an invasion of India, joining the Jihad against the Allies proclaimed by the Turkish Sultan and Caliph. Unfortunately for the Germans, the details of the agreement are less binding on the Afghan king. Afghanistan does not have to go to war until the Germans supply Habibullah with substantial quantities of arms, advisors and money. Given how difficult if was for Niedermayer and Hentig to travel to Kabul across British and Russian patrolled Persia these gifts are unlikely to arrive in Kabul in the immediate future. Habibullah has effectively committed to an imaginary Jihad that will never take place. The Senussi religious brotherhood of Libya have launched incursions into western Egypt in the hope of provoking a revolt against the British presence in the country. While some sympathy for the Senussi has been noticed in the Egyptian army, there has been no general uprising by the Egyptian people. British dominance of the country remains secure. British forces have begun to push back against the Senussi and have had some success. Today they attack the Senussi near Bir Tunis in the western desert. The fight is less one-sided than the British might have expected: the Senussi put up a stout resistance and display a level of discipline under fire that surprises the British. 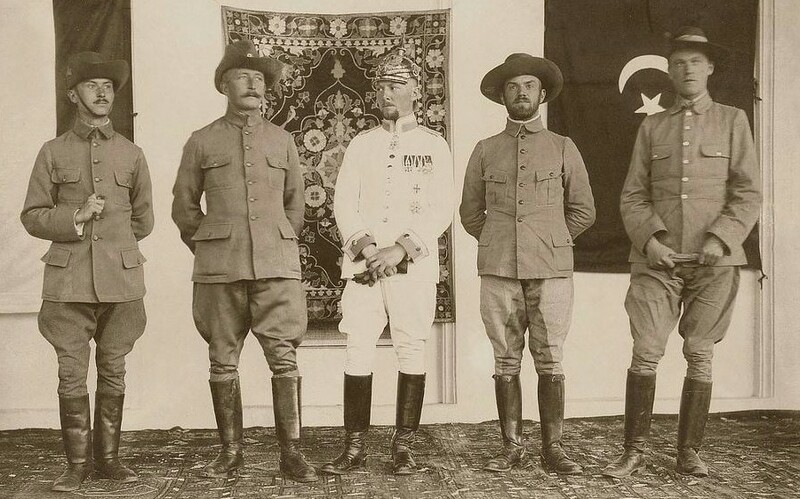 Nuri Bey and other Turkish advisors would no doubt claim any credit for the Senussi’s brave performance. Even so, the British prove victorious. However the Senussi are able to melt away into the desert, avoiding the decisive defeat that would put an end to the menace they pose to Britain in Egypt.